Senior broadcast major, Joe Lesar, could have graduated in the fall, but he didn’t want to pass up all the great opportunities the J-school offered in the spring semester. During Fall 2015, Lesar took UM News, where the students produced weekly televised and online stories. As a photographer, Lesar not only supported his reporters, but also produced some of his own “one-man-band” segments for the program. Joe Lesar in the end zone during the Griz v. NAU, September 2015. Photo by Peter Riley. Spring 2016 also marked the last semester when Lesar could compete as at student athlete at UM. Lesar ran track at McQueen High School in his hometown of Reno, Nevada, and he wanted to finish his collegiate career as a runner on a strong note. While Track & Field is Lesar’s strongest sport (notably the 400m, 800m and Triple Jump), he also joined the Cross Country team, where the standard men’s 8K race stretches 10 times farther than his longest track event. However, sports provided an important entryway into another avenue of journalism for Lesar. One day, he was walking through the Adams Center and happened to run into the director of Griz Vision, Abe Kurien. 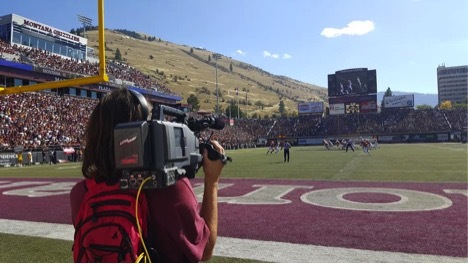 From a simple conversation about shared July birthdays, Lesar landed a job as a videographer for Griz games—football, basketball and volleyball. Now Lesar’s on his second season shooting with Griz Vision and he runs a floor camera right under the basketball hoop. His ability to know what shots Kurien wants covered, without receiving direction via earpiece, means that Kurien can depend on Lesar to get the job done well. By now, Lesar considers it second nature. Learn more about J-school student experiences with Griz Vision here, as documented by Sojin Josephson, sports reporter for the Montana Kaimin. Further interest and inquiries about Griz Vision can be directed to Abe Kurien, via email, agkurien@gmail.com, or via phone, at 406-207-6370.